Laddership Circles are a space for project initiators to dive into the nuances of leading with inner transformation, learn about gift ecology design thinking, and cultivate new patterns of positive deviance that may emerge through the process. 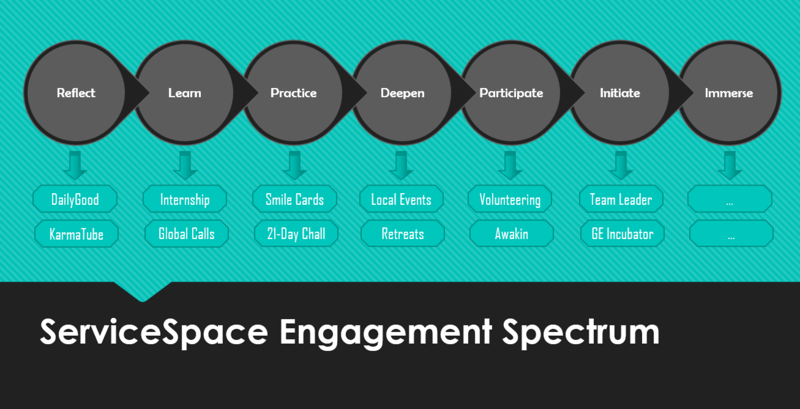 Along the ServiceSpace engagement spectrum, somewhere in between an online university and an incubator, is a space for project initiators to dive into our 'gift ecology' processes, learn about the nuances of leading with inner transformation, and hold space for new designs to come to light. Traditional project incubators support their entrepreneurs in becoming sustainable through money, but the Generosity Entrepreneurs idea is to be sustainable through nature. More specifically, through generosity. In January 2014, we decided to experiment in that direction with an 8-person Laddership Circle. For six weeks, we engaged in readings,practices, weekly video conferences, shared reflections and project design updates on. Since that first circle, we’ve continued, with some remarkable ripples. In Los Angeles, Pranidhi reflected on the business of teaching yoga and launched her yoga studio on a gift basis. In Dubai, Natasha walked into business meetings with a lens of love, and started incubating avenues for priceless retail. 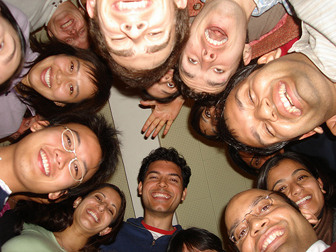 In her Peace Studies program, Fran galvanized her students in “giftivist” experiments at her annual Peace Conference. And in India, Deven dived deeper into Startup Service. To join our next Laddership Circle, please click on the button below and submit the application. One of our coordinators will be in touch with you soon after. From Singapore to Peru, London to Germany to various corners of the US and India, our February 2016 round hails a vibrant mix of ladders experimenting with patterns of positive deviance in tech, law, mindfulness, health and healing, and beyond! Our third iteration in October 2015 hinges around the axis of how to implement deeper values in daily life, alongside our projects. With weekly glimpses into our various micro-moments of generosity, the spirit of transformative inquiry infused our hearty crew of 10! 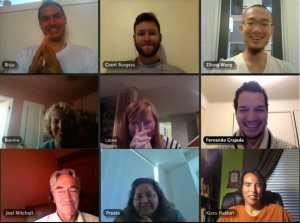 Our pilot circle spilled forward into a wave of enthusiasm for 2 concurrent global circles in June 2015. From gift-economy offerings in yoga and Ayurveda to personal practices in business and beyond-- it was a powerful summer of designing for transformation. In January 2015, we kicked things off with a crew of spirited love warriors engaging an array of labor-of-love projects-- from thought-provoking films to clay-it-forward pottery experiments, transformation in education, a community of “wild dream walkers,” and leveraging tech for gratitude. Gandhi offered a trilogy of "hands, head and heart" and suggested that we, as individuals and cultures, first align those elements and ultimately learn to lead with the heart. Today, we have many vocational schools that amplify the work of hands, many think-tanks that operate with intellectual capital of the head, but we don't have spaces and tools to design projects with "compassion capital”. This is mostly because compassion's effect is distributed -- in time and space -- and hence hard to quantify and fit into an entrepreneurial paradigm. Laddership is an experiment on this topic. With a six-week curriculum progressing from personal to systemic, Laddership Fellows engage with regular readings and homeworks, daily practices, a weekly video conference call, and optional design calls. Examples of topics include the edges of compassion practice in the dominant paradigm: how to engage a heart of gift ecology at work; evolving relationships to capital; and infusing organizational values with micro-acts of kindness, mindfulness, and generosity. In each case, the idea is to really push the boundaries of traditional enterprise, with the intention of developing collective strength to step into new structures over time. This is not a theoretical exercise, but rather a process where we experiment concretely and amplify what works. Implicit through the whole process is deepening our collective capacity to support kindred spirits, and to hold the paradox of questions in our experiments rather than jumping to any preconceived answer. If you are interested in joining a future Laddership Circle, do apply below and one of our coordinators will be in touch. We arrive empty handed, and leave empty handed. So then, how do we want to spend the time in between? If the universe is alive, it makes sense to get rid of undue complexity, live simply, and focus on a conscious relationship with the world around us. To stay connected, you may like to subscribe to our monthly newsletter. If you'd like to reach us on a specific matter, please drop us a note below and we'll get back to you shortly.